Since 1985, RestorationMaster has provided the homes and businesses of Greensburg, PA with quality disaster restoration and cleaning services. We service Greensburg, PA in addition to the southwest Pennsylvania communities of Greene, Allegheny, Washington, Fayette, and Westmoreland counties, and we also service Harrison, Lewis, Marion, and Barbour counties among others in West Virginia. Our IICRC-certified technicians are ready to respond to emergencies and restore your home or business with our advanced cleaning products and equipment. We provide a range of disaster restoration and cleaning services in Greensburg, PA and the surrounding areas, including water damage restoration, soot and smoke damage restoration, fire damage restoration, content cleaning and pack outs, mold removal, and post construction cleaning services. Our technicians are licensed and trained to provide the best possible restoration services and we will work with your insurance provider to help coordinate claims. RestorationMaster holds a Contractor’s License in in the state of Pennsylvania and the state of West Virginia to provide complete construction services. We also help with major losses throughout the U.S. as a member of ServiceMaster’s nationwide catastrophic response network. We have done a lot to help our local community by providing water damage restoration for the Lakeview Resort and Maple Gardens retirement home, flood damage restoration for Superior Roofing, and fire damage restoration at the Slickville, VFD. We are available 24 hours a day, 7 days a week at 888-915-8868 for emergency response in Greensburg, PA and the surrounding communities. 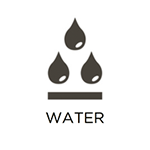 As water damage happens in the majority of homes and buildings, water is pervasive and difficult to keep out. It can seep indoors due to natural flooding and heavy rains as well as overflows, backups, plumbing leaks, and burst pipes. You must treat any case of water damage as an emergency because it can be absorbed in wood, drywall, and other porous building materials, causing structural damage and mold growth. However, RestorationMaster provides water damage restoration and flood cleanup services to remove water from homes and businesses in Greensburg, PA and the surrounding areas to ensure that the affected area is completely dried. A quick reaction to water damage will prevent it from spreading and reduce the risk of extensive structural damage or mold. Fires are very dangerous disasters because they can happen in an instant while posing a risk to the health and safety of your family. Your first priority in a fire is to evacuate and ensure the safety of all affected individuals. But once the fire is out, you must immediately focus on the fire damage restoration. The heat from the fire creates corrosive byproducts that have the potential to cause permanent damage to the affected materials. But RestorationMaster provides fire damage restoration services for affected homes and businesses in Greensburg, PA and the surrounding areas. We will repair the structural damage caused by fires as well as clean and restore objects affected by the corrosive byproducts. 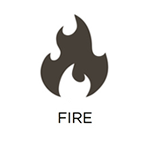 Once a fire is out, this does not mean that you are safe from further damage. Most of the resulting damage from a fire occurs after it is extinguished as smoke, soot, and other corrosive byproducts will linger and damage building materials and furnishings. Soot and corrosive byproducts can tarnish and etch various surfaces and objects while smoke can leave an odor behind that gets absorbed into the building materials. RestorationMaster provides smoke and soot damage restoration services to clean up damage from smoke and other corrosive byproducts in Greensburg, PA. Our chemical cleaners will remove damage caused by soot and corrosive byproducts from a wide range of affected surfaces. We will then use advanced methods to remove smoke odors. Mold is an issue that can occur at any time a home or building has sustained water damage or has high moisture or humidity levels. Moisture is the main trigger of mold growth as the mold colonies feed on cellulose that is found in wood and drywall. 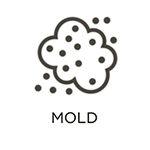 Extensive mold growth will not only result in serious property damage, but also increase the risk of certain health effects such as allergies and respiratory issues. RestorationMaster provides mold remediation services in Greensburg, PA and the surrounding areas to remove mold from affected homes and businesses. We have the proper equipment to test for and remove mold growth while keeping it contained to protect the unaffected areas. When a natural disaster occurs in your home, nothing is safe. Indoor flooding, mold, and fire can cause extensive damage not only to the structural elements and furnishings in your home, but also to your personal items. It is then important to recognize the damage to your personal content and have it restored before your belongings become permanently damaged. RestorationMaster provides content cleaning and pack out services as part of our general disaster restoration in Greensburg, PA. Our technicians will clean, restore, and deodorize your damaged content in your home or take them to our facility for cleaning if your home is in dangerous or unstable condition. Carpeting is found in so many commercial and residential settings. While we may use it everyday, it is still easy to overlook when providing proper maintenance. Constant foot traffic pushes dirt and debris into the carpet fibers, which not only causes the carpet to look dirty, but will also cause the fibers to deteriorate. Vacuuming may remove some of the debris, but it requires professional cleaning to remove it completely. RestorationMaster provides carpet cleaning services in Greensburg, PA and the surrounding areas to clean and restore carpeting in commercial and residential settings. Our technicians can remove deeply embedded debris from all types of carpeting using the hot water extraction method. Completing a construction project in your home will often come as a relief after facing the stressful damage of a natural disaster. However, a construction site is not completely ready for use once the job is done; there is often a fair amount of dust left behind in addition to leftover building materials and tools including nails and screws. 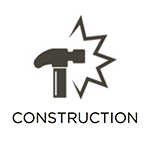 RestorationMaster provides post construction cleaning services in Greensburg, PA and the surrounding areas to clean and restore the site of a recently completed construction project. Our technicians will then remove the dust in your home and ensure the jobsite is free of all debris. We are available 24/7 at 888-915-8868 for all post construction cleaning services in Greensburg, PA and the surrounding areas.